After years of hard work on January 9, 2007, Steve Jobs let the lion out of the basket. Let’s say it with William Shakepeare: Well roar’d Lion. This All-In-One is still the basis of Apple’s success making 53% of the total sales as reported in the SEC filing for the fiscal year 2012/2013. Within the company it takes the lion’s share when it comes to revenues, customer satisfaction, and brand loyalty. Today it’s much more than just ‘the internet in your pocket’. It’s seamlessly integrated in Apple’s product line-up and services. Hundreds of thousands of apps let users do everything they want to do. It’s a fact that Apple’s iPhone is the smartphone with the highest build-quality as compared to all competitors. High quality makes a device attractive for people with substantial income and goes along with weakness in demand in emerging markets. But it’s not only the hardware which makes a device successful. The environment is an essential part of product acceptance and success. It’s the All-In-One idea represented by the Apple ID the company offers its customers. You order the latest Porsche 911 GT 3, for sure the company’s flagship. It’s delivered to an place about 250 miles south-west of India. I’m talking about a small part of the 1192 islands of the Republic of the Maldives. Your GT 3 is powered by a 475 hp engine and runs about 195 mph. Unfortunately the island is just about 500 ft in diameter and so I’m sure you won’t need one of the implemented airbags, the anti-skid breaking system, or any other innovative feature. It’s the environment, the ecosystem, which makes a device as powerful as it is seen today pulling millions of people into it. Beside the internet, not provided by Apple, it’s the App Store, iTunes, iCloud, and more wherein an iPhone feels well and with it Apple’s customers. From 2007 on Apple released phones to beat the iPhone every year. The company breathed life into the device with a seamless to use operating system, iOS, which got a completely new design in October 2013. 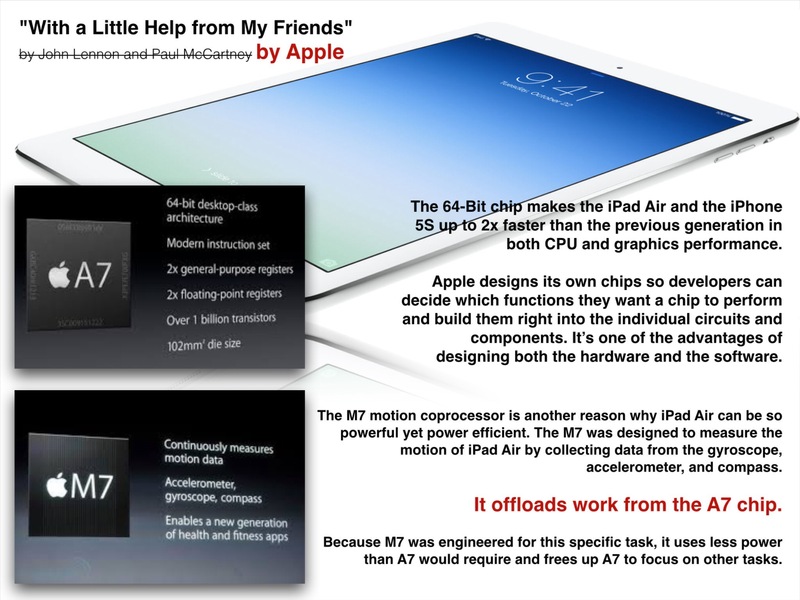 The credit belongs to Sir Jonathan Ive, Senior Vice President of Apple’s Industrial Design. Compared to a human being the iPhone has it all, admittedly with some limitations regarding the brain, sorry, the processor and the memory which still cannot beat the human specs. 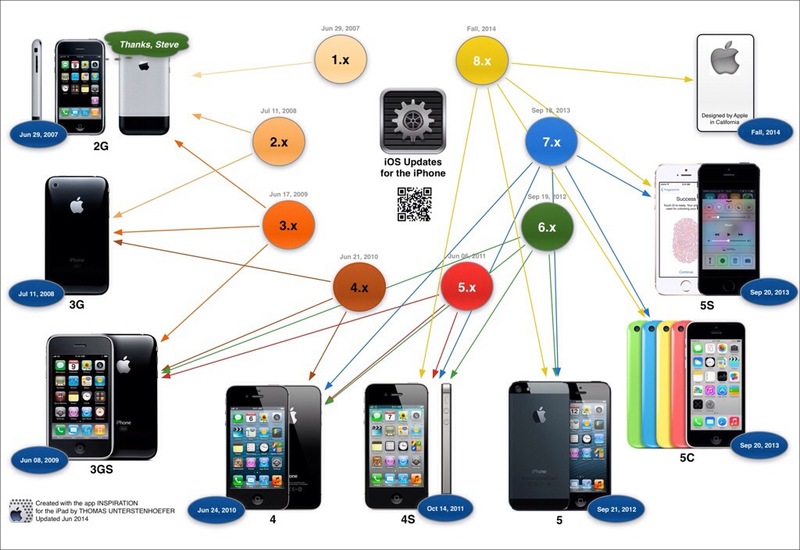 Fanboys, following competing platforms always refer to the design of iOS, the missing features for customization, and a liaison with Apple’s ecosystem, aka vendor lock-in. They ignore the fact that there is a OS-DNA, a well-considered design strategy, not shown on the touch screen but in the depths of its code. According to malware researchers at F-Secure Labs, the number of active mobile threat families and variants initially spiked in Q4 2012, with Android’s share jumping from 49 out of 74 known threats to 96 out of 100, with the balance being related to Nokia’s essentially mothballed Symbian platform. That was enough to rouse a tweet from the rarely used account of Apple’s head of worldwide marketing Phil Schiller, who linked to the report with the brief admonition “be safe out there”. However, F-Secure’s new report for Q1 2013 shows Android now accounts for 136 out of 149 known threats, or 91.3 percent of all malware activity (up from 79 percent in 2012). The other threats remained related to Symbian, with zero discovered for Blackberry, Microsoft’s Windows Mobile/Phone or Apple’s iOS. The research noted that mobile threats are overwhelmingly motivated by profits, with 76.5 percent designed specifically to con users out of money, rather than seeking to just cause damage. If you like customization you are welcome in Android’s monopoly on malware. 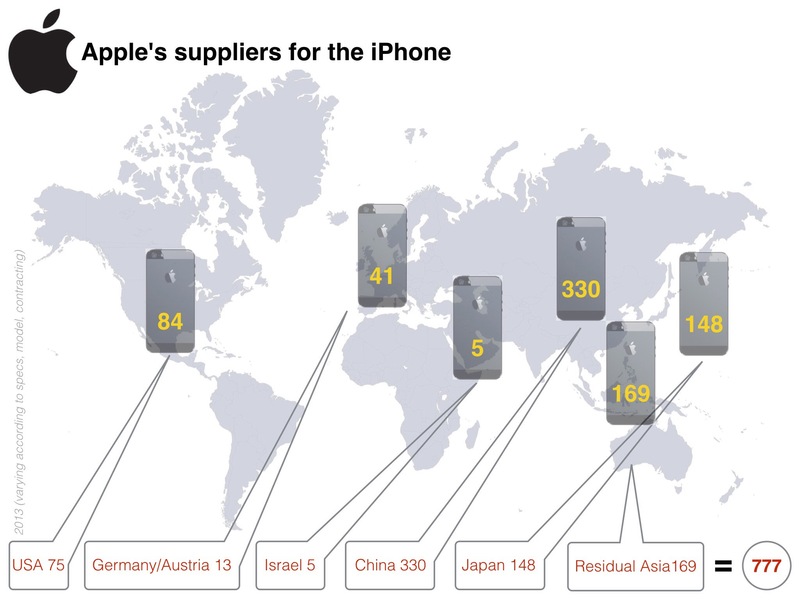 Manufacturing an iPhone is done by 777 companies all over the world. The Chinese company Foxconn, assembling devices, is able to employ 230,000 assembly line workers producing 72,000 back plates for the iPhone per day. 40% of consumer electronics worldwide are made by Foxconn in a large number of production lines. The company is a contracting party of Apple, Dell, Nintendo, Motorola, Amazon, Nokia, Sony, Samsung and others. Since years international organizations like the UN or Transparency International are monitoring human rights. What does Apple do? In contrast to the RMG industry Apple takes care of labor conditions. The company undertook many steps and is taking towards all issues regarding infringements of human rights (unlike other tech companies). Ending the industrywide practice of excessive overtime is a top priority for Apple. They tracked work hours weekly at a handful of suppliers, and when they found excessive hours, they were able to address the problems quickly with the supplier. 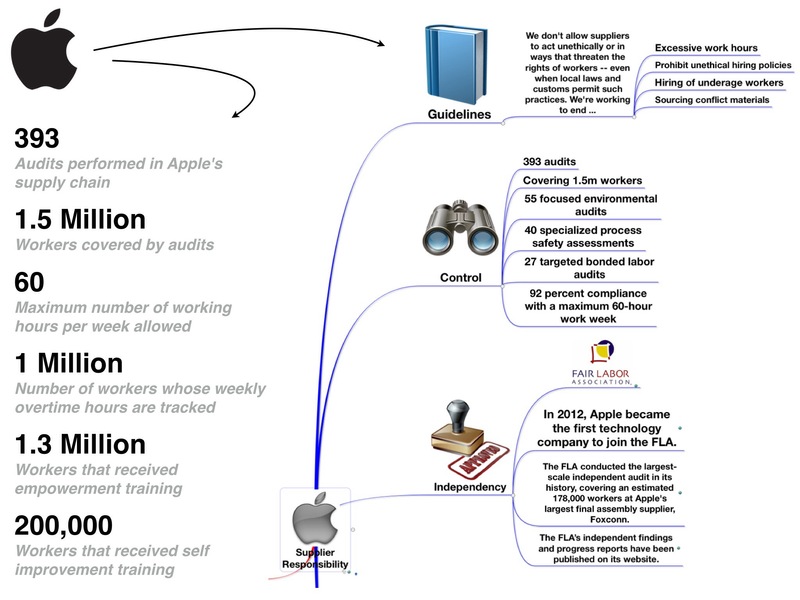 In 2012, Apple expanded that program and tracked work hours weekly for over 1 million employees, publishing the data every month. As a result of this effort, the suppliers have achieved an average of 92 percent compliance across all work weeks, and the average hours worked per week was under 50. Many large companies are members of the Fair Labor Association (FLA). Activities of the FLA are targeted to audits of the company’s suppliers, mainly located in foreign countries. Reports are published on the FLA website. Members of the FLA are e.g. Apple (as the first technology company), adidas, asics, Fruit of the Loom, H+M, Nestle, Nike, Puma, S.Oliver, etc. Apple’s main competitor Samsung is not an affiliate of the FLA. The list shows that most of the members are companies active in the garment industry. The FLA regularly reports about audits (announced and unannounced) and everyone can download the reports in Adobe PDF or Microsoft Excel file format. Apple’s membership in the FLA shows the companies efforts to take care of the environment in which it’s products are manufactured. Beside Apple’s ecosystem there is a much greater and more important one, our planet. In April 2014 scientists elaborated that parts of China are no longer suitable as a habitat for human beings, animals, and plants because of a tremendous pollution load in the air, the water, and the soil. Cormorant energy eaters are the worldwide growing number of data centers which are necessary to offer all the services electronic devices are using. 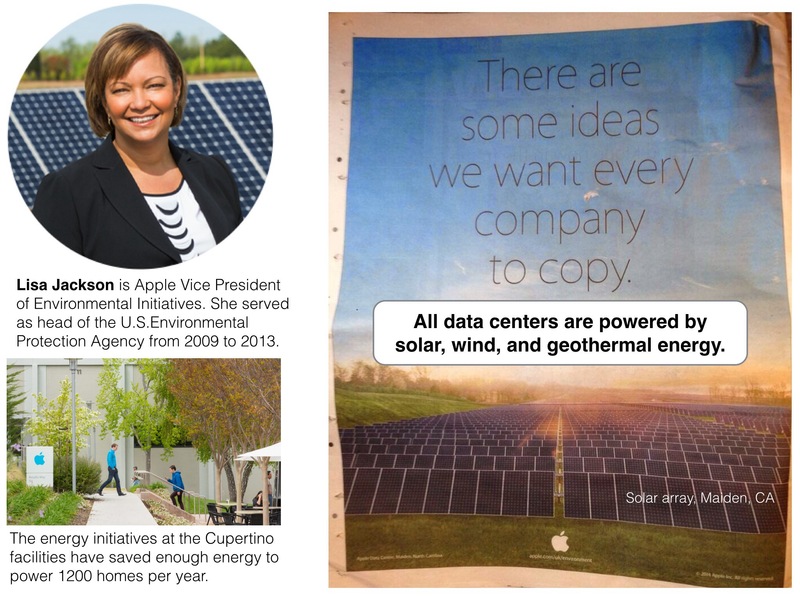 In contrast to others Apple accepts the climate change as a fact and wants “to leave the world better than we found it”. So here are some facts about Apple’s facilities providing iCloud, iMessage, Facetime, Stores, and administration services, published in April 2014. We designed our Maiden, North Carolina, data center from the ground up for energy efficiency, and it has earned the LEED Platinum certification from the U.S. Green Building Council — the first data center of its size to be honored. On any given day, between 60 and 100 percent of the renewable energy it uses is generated onsite through biogas fuel cells and two 20-megawatt solar arrays — the nation’s largest privately owned renewable energy installation — and we purchase any remaining power we need from entirely clean sources. The Maiden center generates 167 million kilowatt-hours of renewable energy onsite per year — enough to power the equivalent of 13,837 homes. Our data center in Prineville, Oregon, is every bit as environmentally responsible as the one in Maiden. We’re building a micro-hydro system that will harness the power of water that flows through local irrigation canals. When completed in 2014, it will serve most of the center’s energy needs, In the meantime, since Oregon allows the direct wholesale purchase of renewable energy, we’re able to directly access enough local wind energy to power the entire data center. Our newest data center, in Reno, Nevada, follows in the footsteps of our 100 percent renewable energy centers in Maiden and Prineville. We’re working with the local utility to codevelop an 18- to 20-megawatt solar array using a new kind of photovoltaic panel with curved mirrors to concentrate sunlight. Expected to be operational in early 2015, the solar array will have an annual production capacity of over 43 million kilowatt-hours of clean, renewable energy. Until then, the center will be powered by renewable geothermal energy purchased from the local utility. Like our facilities in Maiden, Prineville, and Reno, our data center in Newark, California, is powered by 100 percent renewable energy. We hit this milestone in January 2013, when we began serving the data center with energy sourced primarily from California wind power. We’re acquiring this energy directly from the wholesale market through California’s Direct Access program. Investments in low-pollution manufacturing are one of the reasons why Apple products are expensive. 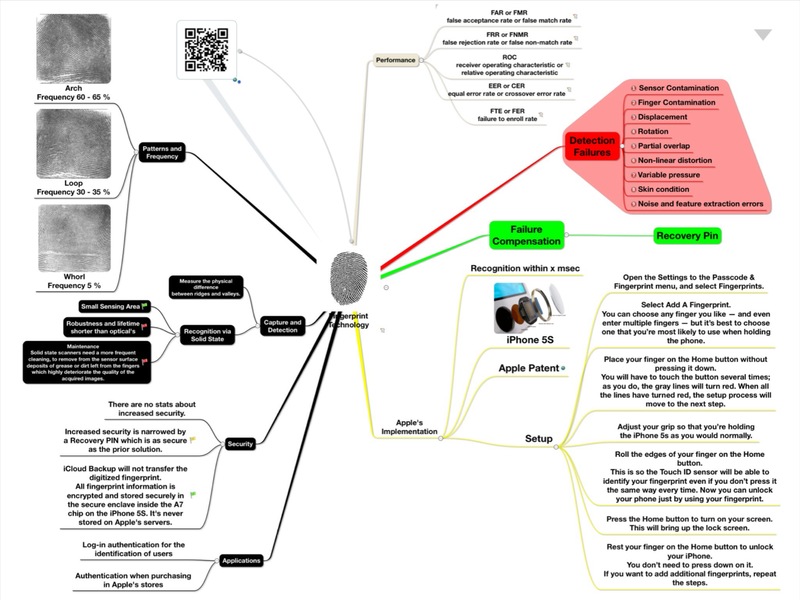 To manufacture smartphones with nearly the same features of an iPhone for half the price is only possible with a rigorous exploitation of the resources. Well, 330 suppliers of Apple are located in China but there are strong efforts to bring parts of the production back home. At the time this is only possible for some computer products but not for mobiles because of missing capacities of human resources. 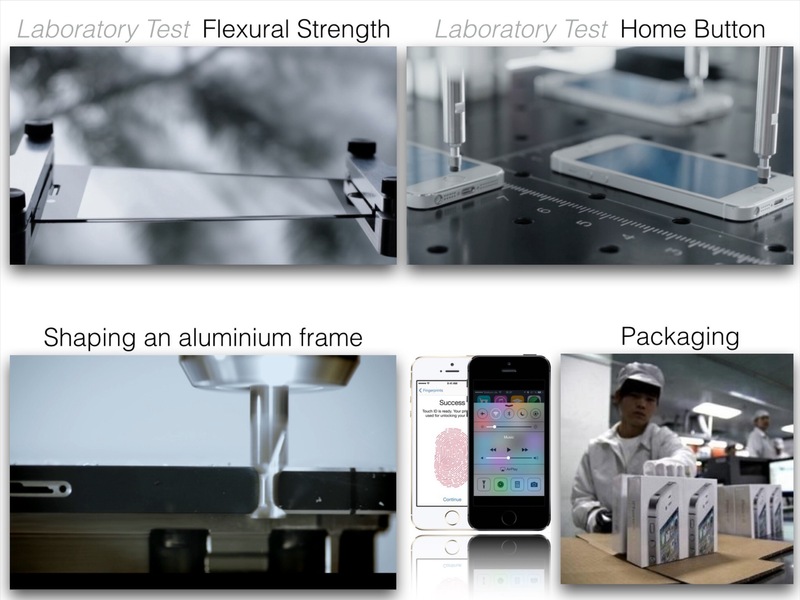 There is just one company able to assemble hundreds of thousands of mobile devices within a narrow timeframe. It’s the Chinese-based company Foxconn. ABC News’ Bill Weir was invited to take a look inside Foxconn. 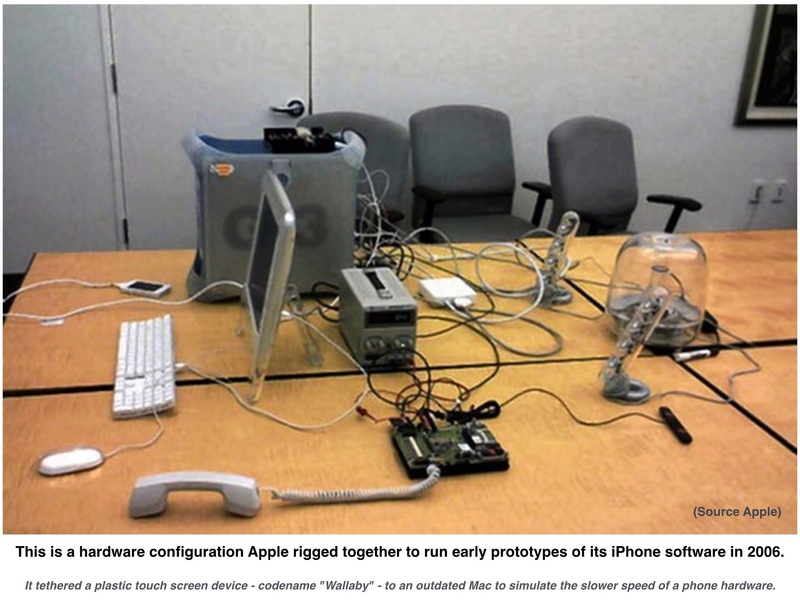 Outsourcing is the key to Apple’s supply chain success. Apple outsources manufacturing and assembly to suppliers. Many suppliers are “fabless” (no company-owned fabrication facilities) and, in turn, outsource fabrication. Companies headquartered in the US and Europe subcontract fabrication to Asian companies. Many of these Asian companies based in Japan, Taiwan and South Korea then outsource fabrication to places with cheaper labor or greater ability to scale up production. That’s how everything ends up being Made in China. Singapore, Malaysia, Thailand, and the Philippines get a lot of the adion, too, mostly as suppliers for back-end components. Apple events are always an exciting show viewed by millions of people. It was the event in October 2013 with the most significant steps since iPhone’s birthday in 2007. In 2012 Apple acquired Authentec, a Florida-based company specialized on biometric authentication. Authentec’s fingerprint sensor debuted on the iPhone 5S one year later. With no production facilities of its own, all fabrication is outsourced to Taiwanese company TMSC, which does most of the manufacturing in its Shanghai facilities. The Touch ID (Apple’s implementation of a fingerprint scanner), improves seamless usage and security and can be seen as a first step to payments using biometric authentication. Apple realizes the value of wearable tech through M7 – a mixed signal chip from NXP (Netherlands), which can make sense of the data from the motion detected by the iPhone accelerometer of Bosch (Germany), gyroscope of STMicroelectronic (Italy) and electromagnetic compass of AKM (France). 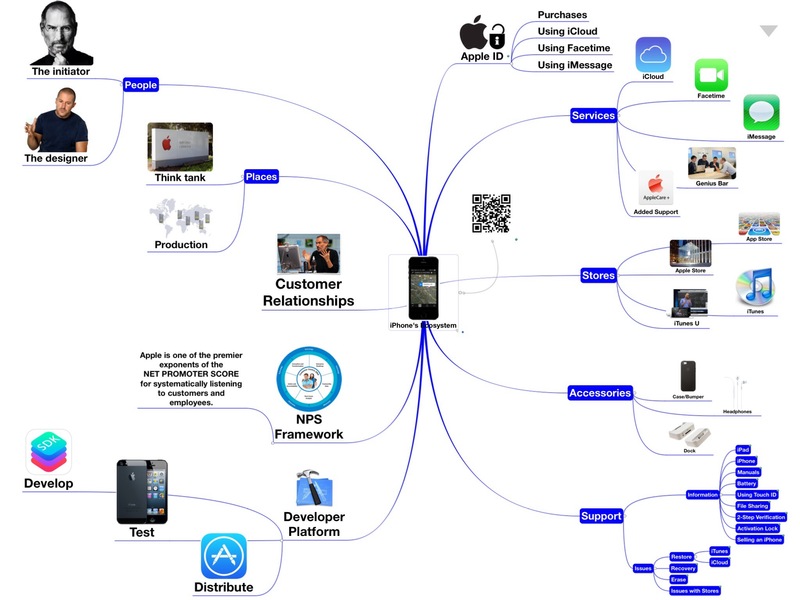 Current and future apps that can take advantage of this data are poised for the jackpot. 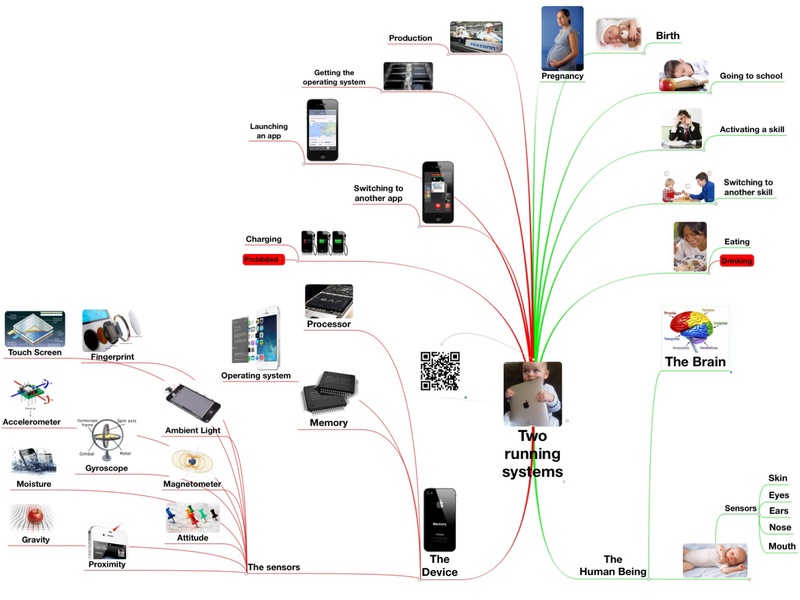 It’s the iPhone which is the carrier for new and innovative technologies or even disruptive technologies. As the leading industrial nation the USA developed rules for financial reports which are basically overtaken by the majority of other countries. The responsible commission in the USA is the SEC (U.S. Security and Exchange Commission). 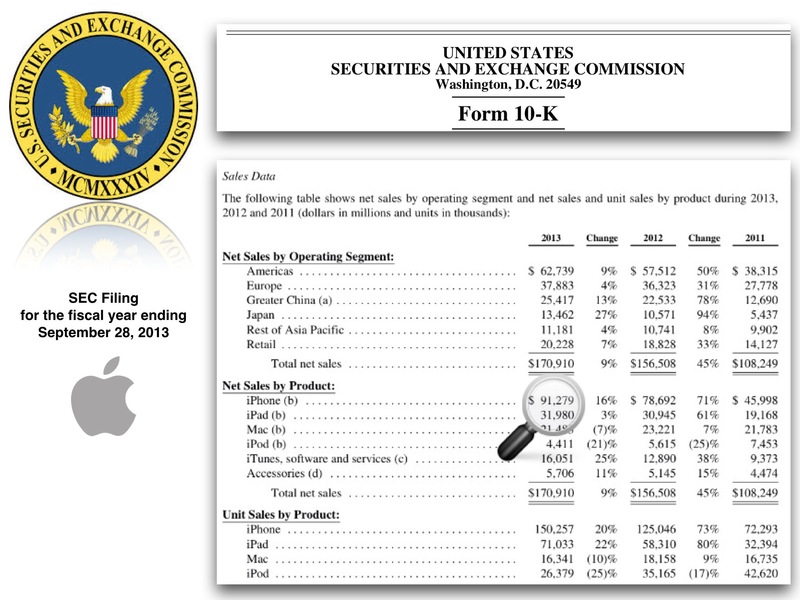 If we look at Apple’s SEC filings of the fiscal year 2012/2013 which ended on September28, 2013 we can see that the company is dependent from iPhone sales. Total net sales were $170,910m with $91,279m generated by the iPhone which is about 53% of the companies sales. If we include the iPad as the 2nd important iOS device, 72% of the company’s sales are generated by mobile devices. 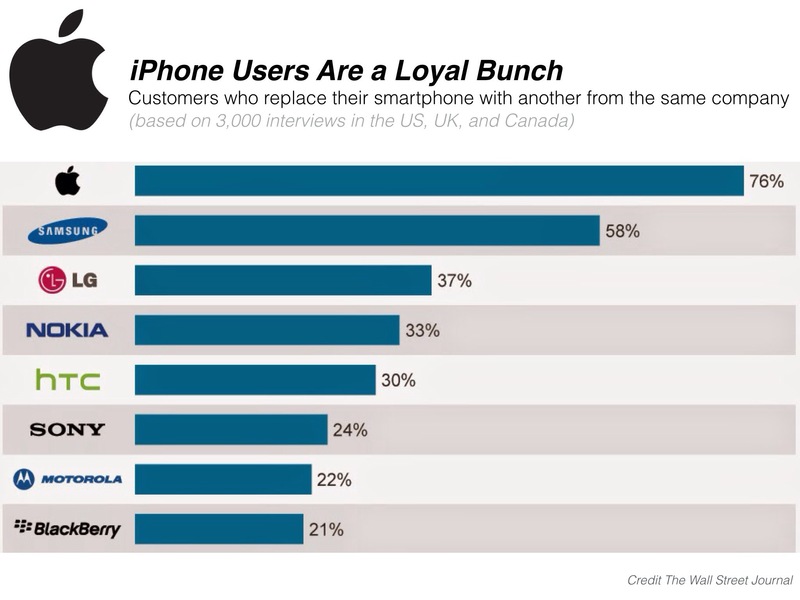 So it’s quite clear that mobiles call the shots. Immediately after the launch of a new iPhone rumors about a successor start. No other company is in a daily focus of publishing media no matter authors like or hate what’s launched in Cupertino. The iPhone is Apple’s engine, the carrier of innovative technology. The credit belongs to Steve Jobs whose vision of the ‘Internet in your pocket’ initiated a fiercely competitive market in which all leading tech companies participate. Google, Samsung, and Microsoft force Apple to keep the innovative power in a transition phase from PC to mobiles.